Husky Stadium was rocking and hostility toward anyone in green and yellow was in the air. A huge win at then-19th-ranked USC plus nine days of rest and confidence-building and a 12-game losing streak to the Ducks on the line, it appeared it might have been Washington’s game to lose. The battle came down to the second-to-last play of the game. An Oregon team that looked ready to turn the corner and face adversity kept the winning streak alive in time for a much-needed bye week. Tui Talia had a great game against the Huskies. 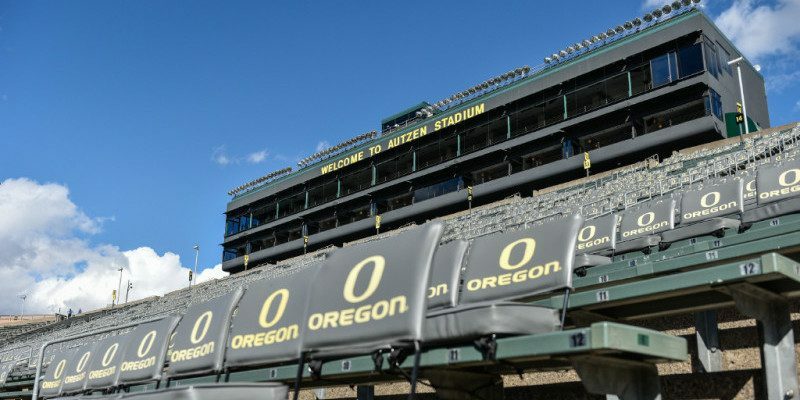 The Ducks will not only use the bye to continue to improve the young defensive backfield, correct offensive line mistakes and rehab the finger of starting quarterback, Vernon Adams – Oregon will also hit the recruiting trail with some confidence and determination. Anyone watching the game in Husky Stadium knew this team is different from the prior week in the loss to Washington State. Two weeks ago Nik Brownlee wrote his recruiting update about future quarterback recruits. Since that article was published, the Ducks offered and received a commitment from local product Justin Herbert. Oregon coaches have been watching Herbert closely because his highlights are limited, due to a broken leg suffered during his junior year. Oregon is the first of the big five conferences to offer him a scholarship. With Terry Wilson (who flipped from Nebraska) and Herbert both on board, the likelihood of struggling Seth Green keeping his commitment as a QB is low. So, I see this class taking only two QBs this cycle unless an offer goes out to Maryland commit Dwayne Haskins. Haskins is a big-time pro-type talent who may have second thoughts about his commitment since the head coach was fired. 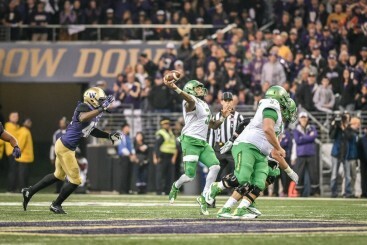 Finally, according to 247sports.com’s own Justin Hopkins, Oregon has requested transcripts for another quarterback. California 3-star Cole McDonald has some pretty impressive mid-season senior highlights, in which he throws accurately and runs an option attack with deceptive speed. Vernon Adams will leave after one year, so Oregon will need a quarterback. My gut feeling is that Scott Frost will rely on redshirt freshman Travis Jonsen to compete for the starting QB position in the spring. He has a good shot at taking over the reigns. This depends on whether redshirt sophomore Morgan Mahalak sticks with Oregon and decides to put in real work. Beyond that, Frost may be focusing more on the class of 2017 for another high-profile QB, hoping that 4-star Ryan Kelley commits to the Ducks by the end of November. If Kelley commits elsewhere, there may still be a chance with Hawaiian dual-threat Tua Tagovailoa, who plays for the same high school Marcus Mariota attended. Tagovailoa has been interested in USC for a long time; however, Oregon has not offered yet and with the change of head coaches in L.A., Tagovailoa may sway the way of Eugene if things don’t pan out with Kelley. Home games are perfect opportunities to display what a university is all about and how the program weaves football with academic goals. It’s a time to show off the amazing facilities and the home crowd support. Oregon usually does a wonderful job at impressing its recruits and their family members. Parents are very persuasive at times, and if they love the visit, a signed fax in February is almost guaranteed. 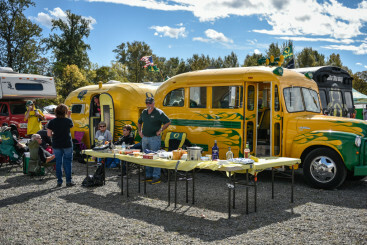 There is a lot of fan support for Ducks football. 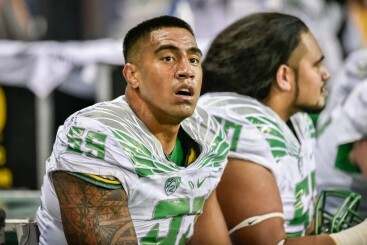 Two huge visit weekends came during Oregon’s games against Utah and Washington State. There were nine official visitors for each of the two games; however, the outcome of those games was not favorable. Despite the outcome, Oregon was able to get a verbal commitment from 4-star defensive end Bryson Young, from California. Young is a much needed asset for the defense and has great size and strength to put pressure on opposing quarterbacks. There were other top Oregon targets who left Eugene impressed with what they saw. Three-star Michael Alves is an offensive guard who keeps everything close to the vest with regards to his recruitment, but it seems like a verbal commitment to Oregon is inevitable. A couple linebackers with soft commitments elsewhere each came away with a better feeling about the Oregon program in 3-star Keith Simms from Maryland and 5-star Caleb Kelly from California. Kelly is aware that a 5-star linebacker has never signed with Oregon — possibly ever. 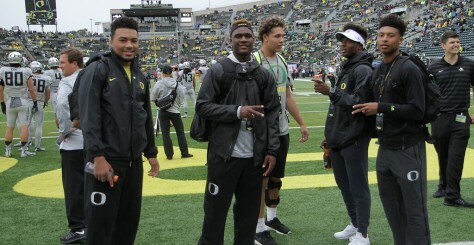 Committed high school prep stars for Oregon. Future official visits to keep tabs on will come during the California and USC games. For the California game, Oregon will host 3-star defensive end Andrew Fitzgerald and 4-star wide receiver Javon McKinley. In November, USC comes to Eugene and the Ducks will hosts a Trojans de-commit, linebacker Daelin Hayes and 3-star Kansas defensive end Isaiahh Loudermilk. It would be great to take advantage of the USC chaos and steal a recruit or two away. So far during the bye week, Oregon has been able to make a few offers and one in particular is to a junior out of Florida. The all-purpose, all-everything CJ Cotman is a 4-star speedster that would compliment the Oregon offense. Cotman is quick to the gaps and elusive in the next level, and bursts of speed get him past the safeties. Hopefully he loves Oregon. Possibly the most notable news is the offer to 4-star wide receiver Dylan Crawford. He has always said that Oregon is his dream school. He immediately put the Ducks in his Top 5 and is planning to take an official visit to Eugene. This is always good news to hear for us Ducks fans. 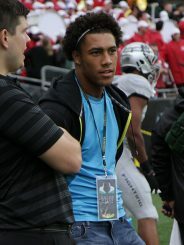 Caleb Kelly would be the first 5-star linebacker for Oregon. The coaches are making visits during this bye week and looking closely at a few athletes across the nation; however, in the Ducks’ own back yard Don Pellum watched a huge 6-foot-7, 300 lb. offensive lineman practice earlier this week. Moustapha Toure, from Horizon Christian High in Tualatin, Ore., is a touring presence getting some recognition from universities. This could be a potential offer and U of O will have a large advantage with Toure being so close to home. By the end of the weekend of this bye week there will be more developments in new names to keep an eye on the next three months. The Ducks like to finish strong with recruiting and it appears they are in good shape to stay consistent.